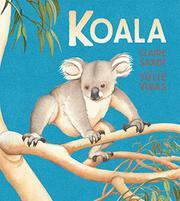 Through the home-seeking journey of one young, male koala, readers learn general facts about these Australian natives. As the story opens, the koala wakes and attempts to nurse but is spurned by his mother. His story is presented in large type, with display type for the text’s gentle exhortations: “Climb, little Koala. It’s time to find your own way.” Smaller print offers additional information for older readers: the mother is pregnant, so now she will ignore her joey. This format continues throughout, as the koala eats eucalyptus and searches for a new arboreal home. The text is not sparse, but it has been thoughtfully composed for young readers and listeners. On the first page, the koala is described as “tall as a toddler,” with “paws perfect for climbing.” When he decides against climbing a tree because the bark stinks, the small print explains that the koala is smelling an odor from another male’s scent gland; the tree is previously claimed. Watercolor illustrations follow the text closely, showing the koala through days and nights, in all kinds of weather, and using an unusual, kangaroolike gait when he flees from a snake. Relatively challenging words such as “hesitates,” “sapling,” and “leaf litter” are evident from the context of words and pictures, and “marsupial” is explained early on. The koala’s trials are real, but they are also brief enough to assuage any reader anxiety.